› Author Affiliations Funding This work was supported by grants from the Academy of Finland (grant 274852 to P.R. ), the Finnish Foundation for Cardiovascular Research (to P.R. ), the Paavo Nurmi Foundation (to P.R. ), the Deutsche Forschungsgemeinschaft (STE-1053/3–1 to S.S. and as part of the SFB1123 TP A1 to C.W. ), the Else Kroener Fresenius Foundation (2013_A114 to S.S.) and the European Research Council ERC (AdG 692511 to C.W.). In the past few years, the endocannabinoid system has emerged as a pathophysiologically activated lipid signalling system in atherosclerosis and metabolic disorders. Endocannabinoids are endogenous arachidonic acid-derived lipid mediators produced ‘on demand’ by the cleavage of membrane fatty acids, which bind to cannabinoid receptors CB1 and CB2. 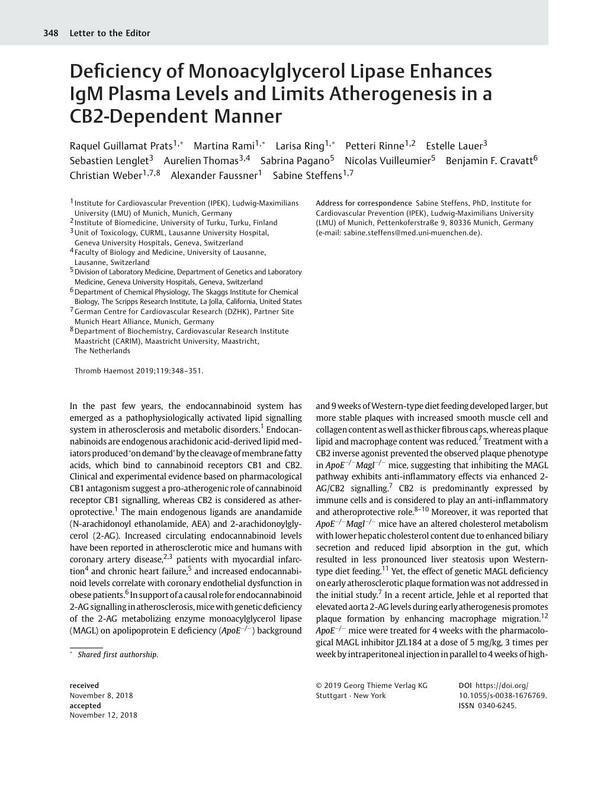 Clinical and experimental evidence based on pharmacological CB1 antagonism suggest a pro-atherogenic role of cannabinoid receptor CB1 signalling, whereas CB2 is considered as atheroprotective. The main endogenous ligands are anandamide (N-arachidonoyl ethanolamide, AEA) and 2-arachidonoylglycerol (2-AG). Increased circulating endocannabinoid levels have been reported in atherosclerotic mice and humans with coronary artery disease,  patients with myocardial infarction and chronic heart failure, and increased endocannabinoid levels correlate with coronary endothelial dysfunction in obese patients. In support of a causal role for endocannabinoid 2-AG signalling in atherosclerosis, mice with genetic deficiency of the 2-AG metabolizing enzyme monoacylglycerol lipase (MAGL) on apolipoprotein E deficiency (ApoE−/− ) background and 9 weeks of Western-type diet feeding developed larger, but more stable plaques with increased smooth muscle cell and collagen content as well as thicker fibrous caps, whereas plaque lipid and macrophage content was reduced. Treatment with a CB2 inverse agonist prevented the observed plaque phenotype in ApoE−/−Magl−/− mice, suggesting that inhibiting the MAGL pathway exhibits anti-inflammatory effects via enhanced 2-AG/CB2 signalling. CB2 is predominantly expressed by immune cells and is considered to play an anti-inflammatory and atheroprotective role. Moreover, it was reported that ApoE−/−Magl−/− mice have an altered cholesterol metabolism with lower hepatic cholesterol content due to enhanced biliary secretion and reduced lipid absorption in the gut, which resulted in less pronounced liver steatosis upon Western-type diet feeding. Yet, the effect of genetic MAGL deficiency on early atherosclerotic plaque formation was not addressed in the initial study. In a recent article, Jehle et al reported that elevated aorta 2-AG levels during early atherogenesis promotes plaque formation by enhancing macrophage migration. ApoE−/− mice were treated for 4 weeks with the pharmacological MAGL inhibitor JZL184 at a dose of 5 mg/kg, 3 times per week by intraperitoneal injection in parallel to 4 weeks of high-fat diet (HFD; 1.25% cholesterol) feeding. The authors validated that the administered dose was sufficient to increase plasma and aortic tissue 2-AG levels. The analysis of atherosclerotic plaques in aortic root cross-sections revealed significantly larger plaques and more aortic macrophages (normalized to the vessel size) in mice treated with MAGL inhibitor compared with vehicle-treated mice. In our experiments based on pharmacological MAGL inhibition as well as genetic MAGL deficiency, however, we observed an opposite effect on atherosclerotic plaque formation. As opposed to Jehle et al, we studied early atherogenesis induced by HFD with a lower cholesterol content (0.15% cholesterol). In a pilot experiment, we subjected ApoE−/− mice to a single intraperitoneal injection of 16 mg/kg JZL184 to measure plasma endocannabinoid levels as previously described. The selected dose was sufficient to maintain 2-AG levels approximately twofold increased for 48 hours, without affecting the AEA levels ([Fig. 1A]), suggesting a selective inhibition of MAGL without affecting the AEA hydrolyzing enzyme. Subsequently, we randomized female ApoE−/− mice to receive 4 weeks of HFD and vehicle or JZL184 injections 3 times per week. The selective increase of plasma 2-AG levels was again confirmed at the end of experiment ([Fig. 1B]). We noticed that JZL184-treated mice gained significantly less body weight upon HFD feeding compared with the vehicle group, while plasma cholesterol levels were not affected by the treatment ([Fig. 1C], [D]). Chronic MAGL inhibition resulted in reduced plaque formation due to less macrophage accumulation ([Fig. 1E], [F]; see [Supplementary Table S1] [available in the online version] for antibodies, available in the online version). Since MAGL deficiency has been reported to increase the half-life of haematopoietic progenitors and leukocytes, we analysed leukocyte counts in the spleen and bone marrow ([Fig. 1G]), without detecting any differences between the vehicle and JZL184-treated groups. In line with previous reports that chronic MAGL inhibition desensitizes brain CB1 receptors, we found a down-regulation of CB1 expression in brain lysates of JZL184-treated mice 72 hours after a single injection, evidenced by Western blot analysis ([Fig. 1H]). A similar decrease was also observed after chronic JZL184 treatment (not shown), which might explain, at least in part, the attenuated body weight gain in our experimental mouse model. Conversely, CB2 expression was not altered in splenic lysates ([Fig. 1H]). CB2 is highly expressed by B cells and regulates their maturation and activation. We found higher protein surface levels of CB2 on B1 compared with B2 cells as measured by flow cytometry analysis ([Fig. 1I]). We further investigated possible changes in atheroprotective immunoglobulin M (IgM) isotype plasma concentrations as an indicator of altered B cell profiles in response to enhanced 2-AG levels (ProcartaPlex Immunassays, Invitrogen). It has been described that B cell-mediated effects on atherosclerosis are subset dependent with B1 cells attenuating and B2 cells aggravating atherosclerosis. The atheroprotective effect of B1 cells is thought to be mediated by the production of IgM antibodies,  which bind to oxidation-specific epitopes on low density lipoproteins (LDLs) and block oxidized LDL (oxLDL)-induced inflammatory cytokine production and foam cell formation. Indeed, we determined a significant increase in IgM plasma concentrations in JZL184-treated mice ([Fig. 1J]). Fig. 1 (A) Endocannabinoid anandamide (AEA) and 2-arachidonoylglycerol (2-AG) plasma levels after a single intraperitoneal (i.p.) injection of 16 mg/kg JZL184 (n = 2 ApoE−/− mice per time point; mean ± standard error). (B) Endocannabinoid plasma levels in ApoE−/− mice after 4 weeks of high fat diet (HFD; 0.15% cholesterol) and chronic JZL184 (16 mg/kg i.p., 3 times per week) or vehicle treatment (n = 5 vs. 6). (C, D) Body weight (n = 12 vs. 12) and total plasma cholesterol levels (n = 15 vs. 15) determined by colorimetric assay of ApoE−/− mice after 4 weeks of HFD ± JZL184 or vehicle. 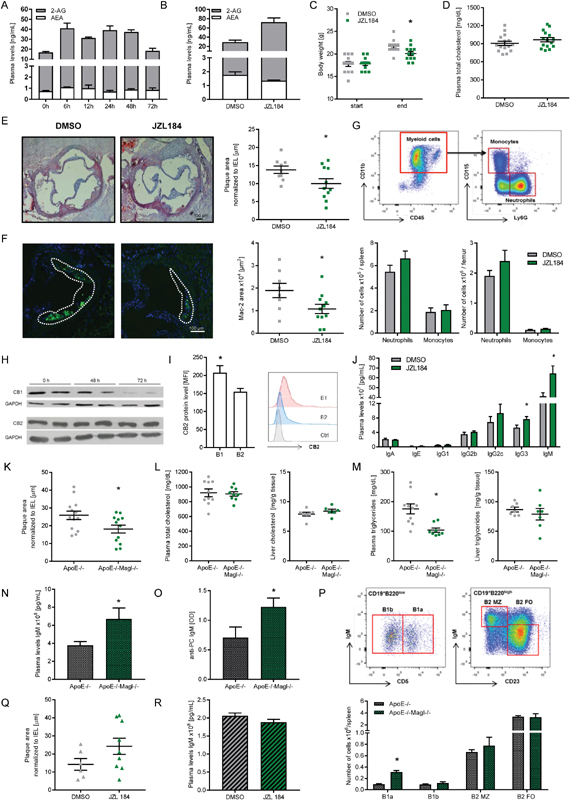 (E) Representative Oil-Red O lipid stainings and quantification of the plaque area within the aortic roots of ApoE−/− mice after 4 weeks of HFD ± JZL184 or vehicle, expressed as plaque area normalized to vessel circumference (internal elastic lamina circumference, IEL; n = 9 vs. 11). (F) Representative Mac-2 immunofluorescence stainings (green) and quantification of macrophages within the plaque area (delineated by the white dotted line; nuclei are visualized with Hoechst 33342 in blue; n = 8 vs. 11). (G) Representative gating strategy for the identification of leukocyte subsets (dot plot showing femoral bone marrow of a vehicle-treated ApoE −/− mouse, after pre-gating for living single cells), as well as quantification of neutrophils and monocytes in the spleen and bone marrow of ApoE−/− mice after 4 weeks of HFD ± JZL184 or vehicle (n = 12 vs. 12). (H) Western blot analysis of CB1 (58 kDa) in brain lysates and CB2 (40 kDa) in spleen lysates of ApoE−/− mice after single injection of JZL184 (n = 2 mice per time point). Glyceraldehyde 3-phosphate dehydrogenase (GAPDH) (36 kDa) was used as loading control. (I) Flow cytometric analysis of CB2 protein levels on B cell subsets measured in ApoE−/− mice (B1 were identified as CD19+B220low, B2 as CD19+B220high; n = 6). (J) Plasma immunoglobulin (Ig) levels of ApoE−/− mice after 4 weeks of HFD ± JZL184 or vehicle (n = 9 vs. 10). (K) Quantification of normalized plaque areas within aortic roots (n = 13 vs. 12), (L) cholesterol and (M) triglycerides in plasma (n = 10 vs. 9) and liver (n = 7 vs. 7), (N) total IgM (n = 8 vs. 8) and (O) anti-phosphorylcholine (PC) IgM (n = 10 vs. 9) plasma levels of ApoE−/− versus ApoE−/−Magl−/− mice after 4 weeks of HFD. (P) Flow cytometric analysis of splenic B cell subset counts (B1a were identified as CD19+IgM+B220lowCD5+CD23−, B1b as CD19+IgM+B220lowCD5−CD23−, follicular [FO] B2 as CD19+IgMlowB220+CD5−CD23+, marginal zone B2 as CD19+IgM+B220+CD5−CD23−; n = 7 vs. 7). (Q) Quantification of normalized plaque areas within the aortic roots and (R) plasma IgM levels of ApoE−/−Cb2−/− mice after 4 weeks of HFD ± JZL184 or vehicle (n = 6 vs. 9). D'Agostino–Pearson omnibus normality test was applied and data were subsequently analysed by unpaired Student's t-test. All data are presented as mean ± standard error of the mean unless otherwise indicated. Outliers were determined by Tukey method. A two-tailed p-value of < 0.05 was considered statistically significant. To strengthen our findings, we additionally used a genetic deficiency approach by cross-breeding ApoE−/− mice with Magl−/− mice. In agreement with our findings using pharmacological MAGL inhibition, ApoE−/−Magl−/− mice developed smaller plaques after 4 weeks of HFD feeding compared with ApoE−/− controls ([Fig. 1K]). We did not observe any differences in plasma and liver cholesterol levels between ApoE−/−Magl−/− and ApoE−/− mice ([Fig. 1L]). While the plasma data are comparable with previously published work,  Vujic et al reported a reduction of liver cholesterol levels in fasted ApoE−/−Magl−/− versus ApoE−/− mice after 16 weeks of HFD feeding. These discrepancies might be explained by the differences in the experimental setup (16 vs. 4 weeks of HFD and fasting vs. non-fasting). The liver triglyceride levels were comparable between both genotypes, while ApoE−/−Magl−/− mice had lower levels of plasma triglycerides ([Fig. 1M]). This is again somewhat different to the findings of Vujic et al, who did not observe changes in plasma triglyceride levels. In line with our pharmacological data, ApoE−/−Magl−/− mice had increased plasma levels of IgM ([Fig. 1N]). More precisely, we observed higher plasma levels of anti-phosphorylcholine IgM ([Fig. 1O]), which is one of the key epitopes found on oxLDL and reported to be negatively associated with atherosclerosis development. Flow cytometric analysis of B lymphocyte sub-sets confirmed an increased number of splenic B1a cells in these mice ([Fig. 1P]). In support of a role for CB2 in mediating an atheroprotective B cell phenotype, pharmacological MAGL inhibition in Cb2−/− mice in parallel to 4 weeks of HFD failed to inhibit plaque formation ([Fig. 1Q]) and plasma IgM increases ([Fig. 1R]) compared with the corresponding vehicle group. As to the conflicting findings reported by Jehle et al, we may only speculate that a different dosage of JZL184 (5 mg/kg) and cholesterol diet composition might at least partially explain the discrepancy between these studies. Long et al, who first described JZL184, observed a dose-dependent increase in 2-AG levels. Indeed, Jehle et al detected a 1.5-fold increase of plasma 2-AG levels, while we measured 2.6-fold higher 2-AG plasma levels. Furthermore, it was demonstrated before that CB1 receptor activity and expression are attenuated following high-dose JZL184 administration (16 or 40 mg/kg), but are maintained at low-dose JZL184 treatment (1.6, 4 or 8 mg/kg). Thus, we may speculate that the dose used by Jehle et al was not sufficient to desensitize CB1, which may explain the different outcome on atherosclerosis. A more detailed analysis of receptors involved in their model might help to better clarify potential dose-dependent effects of 2-AG signalling. Our own observations indicating an atheroprotective role of genetic deficiency or pharmacological blockade of MAGL are in line with multiple reports on anti-inflammatory effects in various conditions observed by targeting the MAGL pathway. Mechanistically, our data suggest that blocking the MAGL pathway and thereby elevating 2-AG levels lead to CB1 desensitization and enhanced CB2 signalling, which translates into an atheroprotective B1a–IgM phenotype in our model. Thus, the proposed pro-atherogenic role of enhanced 2-AG levels by Jehle et al should be considered with caution.